Dorothy Wilson MBE is the Chief Executive and Artistic Director of mac birmingham. Here she talks about the evolving role of the pioneering arts centre - which opened its doors in 1962 - in the city's cultural landscape. To some, memories of Britain fifty years ago are of a country where doors were left unlocked, children played safely in the street and where ‘Big Society’ was simply a way of life, rather than a government initiative. But the realities of inner-city Birmingham during that period, as seen by mac birmingham founders Sir Frank Price, John English and his wife Alicia “Mollie” Randle, were very different. With an emphasis on rebuilding and healing in the post-war years, they felt the creativity and artistic engagement of children and young people was being neglected. Active in the Birmingham amateur theatre world of the 1950s, John and Mollie formed a small touring company to explore their ideas about introducing young people to the practice and traditions of theatre. Setting up vast marquees on public park land to perform with and for the city’s children, they developed the novel concept of a permanent arts centre for young people offering practical experience of a wide range of art forms. The project received strong support from Birmingham City Council, which provided the 8.6 acre site in Cannon Hill Park. A complex including arts and performance studios and two small theatres was completed by the mid-1960s, while the outdoor Arena theatre was added through the labour of young international volunteers taking part in work camps. That was then: mac in the 1960s. When mac opened it had a resident professional theatre company but also one of the UK’s few full-time puppet companies. 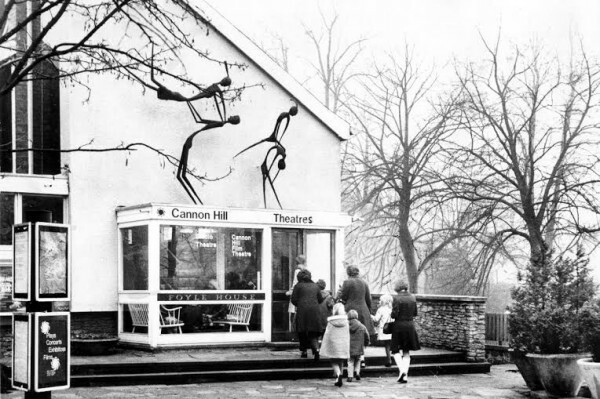 Led by John M Blundall, acknowledged as one of Britain’s most authoritative puppeteers and puppet makers, the Cannon Hill Puppet Theatre worked until 1992, giving many thousands of schoolchildren their first experience of theatre and leaving an important legacy through the many artists it trained. Well-known actors who gained experience in the early years of mac included Tony Robinson – an Assistant Director to John English, Jean Boht and Bob Peck, and Adrian Lester was a member of the Birmingham Youth Theatre, which was resident at mac from 1972 until 1987. Celebrated film and theatre director Mike Leigh worked with young people at mac in some of his earliest experiments in improvisation in the late 1960s. So fast-forward to 2013, skipping over a transformative £15.4m redevelopment programme and we find mac birmingham today, a magnificent open space bustling with “the community”. The centre now boasts four performance spaces, a cinema, performance, visual arts and digital media studio, as well as several spaces for conferences and meetings. But who are the community that cross mac’s threshold over 850,000 times every year? To mac, the community are all artists. The baby making her first hand print, the child exploring animation before a film screening, the retiree who has been coming to the same jewellery-making course for 30 years, the graduate making their first arts council funding application, the mid-career artist’s gallery exhibition, the poet composing at a laptop in the cafe: all are apparent in this space and all are genuinely welcome. Admittedly, some people just pop in for coffee and a cake, but to mac they still have untapped potential. mac sees itself as part of an ecology, nurturing and sustaining artists and connecting them with existing and new audiences. And then we encourage audiences to develop their practical and critical skills supporting their own creative artistic potential. It’s a subtle model, but being an arts centre with a vast learning programme we can do this over a huge range of art forms, entry levels and access points. But when the audience can’t or don’t come to us, the model must flex. Our Next Generation programme is designed to reflect Birmingham’s status as the youngest city in Europe. Its focus on young people age 16-24 might not be entirely revolutionary for an arts organisation, but this programme has caused a stir beyond the region. Of its many projects, the Cannon Hill Collective, a group of 20 young people, has created a series of lectures to help young aspiring artists not only to create, but also to manage themselves as entrepreneurs and businesses: a forward-looking approach. The programme has been so successful it’s going national, with a second run of the lectures planned for London via IdeasTap, a capital-based initiative who signed up mac as their first regional partner. mac achieves that holy grail of exceptionally high diversity rates and balances a programme which manages to remove barriers without compromising content. On shoe-string budgets for a venue of its scale, mac still manages to work outside of its Cannon Hill Park building. We do really well with attendances from across the city in communities that are non-traditional arts attenders. For example 86,000 people engaged with Vanley Burke’s photographic exhibition Rivers of Birminam on their own doorsteps in Handsworth. In partnership with Birmingham City Council, mac works as an “arts champion” in the district of Yardley, where arts attendance is well below the national average, whilst continuing to support a legacy of work in its previous assigned constituency, Hodge Hill. mac makes music is an exciting music programme developed and delivered for children and young people in challenging circumstances and funded by Youth Music to work in Birmingham, Coventry, Solihull, Warwickshire and Worcestershire. mac makes music aims to increase and extend music making opportunities for children and young people who experience barriers to mainstream music education, while supporting their musical development. Currently delivering 17 programmes of work in partnership with schools, inclusion services, hospitals, youth offending teams and behaviour support services, there is also a strategic commitment to influence standards by offering training and continued professional development (CPD) to musicians. James Yaker of Stan’s Cafe on theatrical experimentation as necessity, not luxury.